Excited about your next trip? A new place to explore or the same weekend getaway where you have gone already for ten times with your best buddies but cannot get enough of it? Well, how does it really matter! All that is important is that you should have fun! Be it a solo trip to Cooktown or a group expedition to New South Wales, you must be fully prepared for the adventure. Now, if you choose to go to a place which is known for adventurous sports, you must be sure of camping and when that is happening, do not forget to carry camping lights and lamps. These will be very handy when you guys will sit down for a campfire late at night! Making plans for a weekend getaway to the nearest adventure camps in the most famous hill stations or maybe enjoy the beaches near the Great Barrier Reef? Whatever your plans maybe, but if you are thinking of staying in a tent, then you must make sure of making your preparations with extra heed. Do not forget to carry camping tent lights and lamps for your trip. If you do not have one, you can check out the one available with Perkins and consider its specifications. The lamp comes with a commendable 2000mAh battery which is going to last long enough in your camp and give you a maximum brightness of 400 Lumens. These essential features make it quiet suitable for the purpose. Being adventurous is not a trait which everyone has! And if you are one of those crazy people who do not fear the wildest of jungles or the highest of mountains, who are not scared of fighting with the gigantic waves of the ocean, then you, my friend are really gifted! I am very sure you must be having your trip bag ready always with all the necessities but what you must have always with you is a camping light or a lamp. Camps are generally set up in secluded location where you might end up in unwanted situations at night. You will thank yourself for having a lamp by your side during those times. 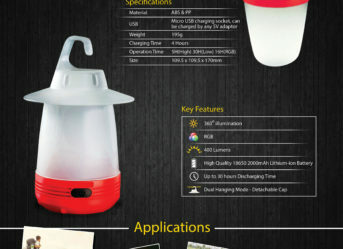 Moreover, having night long conversations in your tent is only possible with the lamp on! Having plans for a trekking trip on the weekend? Well, what is better than taking a break from the hectic life that you have in the most happening cities of Australia! Be sure to make a checklist of all the things that you will need for the trip and if you have not included a camping light for your tent, then please do so! A camping light is an important item that you must carry in your kit so that you have your little tent properly lit during the evening. While searching for the necessary knives on Perkin’s website, you can also have a look at their camping light which has a battery of 2000mAh and brightness of 400 Lumens. Not only the light will give you the required visibility but also keep you safe in the wilderness. Camping lights are a crucial inclusion in tour camping kit if you are a frequent traveller or hiker. You cannot set up your camp in a secluded location without having any light in it! What danger lurches in the darkness of wilderness, you never know, so it is better to play safe! The Perkins camping lights are very handy in this purpose as they are hanging lights, and do not take any space of the compact tent. You can hang the lamp both ways as the lamp cap is detachable and has a hook at its top which can be fixed with the bottom as well as the top of the lamp. This feature of the lamp makes it all the more user friendly and feasible!